CiF chair Jaume Ferrer sat down with Espai Dones president Dolores Fernández to sign a partnership agreement between the two entities to sponsor initiatives promoting equality and gender violence prevention in 2019. With a €3,000 grant from the Council the local chapter of Espai Dones will stimulate engagement and organise programming that pushes issues like gender equality and gender violence prevention into the public consciousness. To get there, the association pledges to host education and public awareness activities around equality and women's rights. 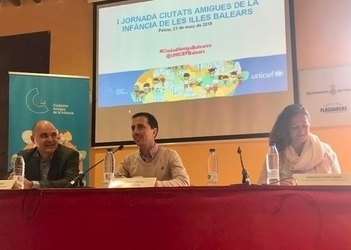 CiF social welfare councillor Vanessa Parellada participated today in UNICEF's “Building municipal networks to promote rights of the child”, a day-long event for Child Friendly Cities in the Balearic Islands. Parellada sat for the round-table “Sharing good practices for Child Friendly Cities”, where she reported on work within the Formentera Council, a Child Friendly City since 2014. The councillor also underscored coordination between CiF offices to propose integrated initiatives for children and youth that foment recreation options on the island. Parellada continued by highlighting efforts to boost young people's participation, holding up youth plenary sessions celebrated twice yearly at the Council seat. “This is not the 'invest in our future because kids are the adults of tomorrow' talk”, said the councillor. “We're saying youth deserve a place at the table by virtue of their worthiness as human beings”. She continued by saying kids “should engage in civic life and bring their own outlook—those optics are often to thank for adults learning important lessons. Sometimes it's about obvious stuff, like recycling, and sometimes it's something that makes perfect sense...but that we adults seem to have forgotten”. Parellada saluted the collaboration of the departments of the Council in renewing the island's Child Friendly Cities bid and pushing forward with the initiative. She celebrated the work of associations that work with children, giving a special nod to groups that work around functional diversity and offered concluding praise to sports clubs, schools and Formentera's other social stakeholders. The Formentera Council's social welfare department reports that in the first quarter of 2019 the administration is on track to pay what it owes in grants and assistance from 2018 to individuals and associations. Sixteen grants (a total of €11,238) will be distributed to islanders over 65 years old or with a minimum disability rate of 33 per cent. Classed as “technical” support, the money is for purchases of materials like wheelchairs, mounting accessible equipment in vehicles, special bedding, hearing aids, dental prosthetics and services like physiotherapy and speech therapy. Four payouts totalling €42,6000 will be made to groups. The Pau Mayans association for the integration of individuals with autism spectrum disorders (APMIPTEA), the association of people with special needs of Eivissa and Formentera (APNEEF), the local chapter of Asociación Española contra el Cáncer and the Formentera association for people living with Multiple chemical sensitivity, Chronic fatigue syndrome, Fibromyalgia and other ailments. Councillor Vanessa Parellada announced she was “thrilled to offer help to individuals and entities that need it”, pointing out that “advancing welfare is our department's guiding aspiration”. 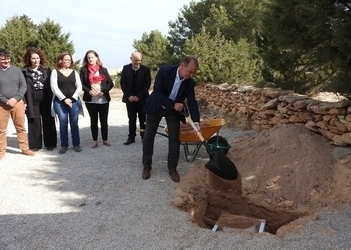 CiF president Jaume Ferrer was joined today by Andreu Horrach, the Govern balear's director of planning and social services, and Vanessa Parellada, who is Formentera's councillor of social welfare, in placing the first stone of the assisted living residence for the aged. The residència's twelve-month build will cost €2.1 million and starts this week. With 14 single and two double rooms, the facility will be able to accommodate 18 dependent individuals. Plans include a hallway connecting the building with the Centre de Dia, a measure which is intended to facilitate sharing of staff and resources (kitchens, laundry rooms and physiotherapy services, for instance) that are already available at the dependent care facility. President Ferrer also indicated the option is on the table for the residència's future expansion. The new facility “rounds out Formentera's public health network”, said Ferrer, referring to something that “first began to take shape in 2007 with the opening of the local hospital and continued four years later with the completion of the Centre de Dia”. Ferrer said the impulse would continue with the forthcoming start of operations at the local funeral home, and, after that, the seniors' nursing home. Andreu Horrach, for his part, said the facility represents “a consolidation of services for dependent islanders” and predicted that, in roughly a year, such individuals would “no longer be forced to travel to other islands to receive care”. Horrach called the project “a good example of inter-administration cooperation” and said the process meant “adapting services to local needs, and using resources already available”. The Palma administration will foot 70 per cent of construction costs and the CiF will pick up 30 per cent. Once the new facility is operational, the Govern will also pay for part of operation costs on a per-person, per-day basis, and the Council will cover the rest. The day's gathering was also attended by diputada Sílvia Tur and councillors from the CiF cabinet and opposition parties. Social welfare councillor Vanessa Parellada sat down this morning at 10.30am with department specialist Azuzena Carrasco and Espai Dones chairwoman Dolores Fernández Tamargo to unveil the activities programme for International Women's Day on Formentera. Parellada and the Espai Dones chair launched a special call for islanders to come out for the Friday march 8 gathering to mark the day in Sant Francesc's plaça de la Constitució. A whole series of activities and events are lined up to celebrate International Women's Day on March 8. From 10.00am Espai Dones representatives will meet in Constitució square to make and invite others to join them in making posters for the demonstration that will take place afterwards. At an informational stand from 11.00am islanders will be able to see texts of experiences re-enacted for the stage, and later, Bloco Colubraria will lead a batucada drum circle. A 12-noon rendezvous, scheduled in honour of International Women's Day and the women participating in the “feminist strike”, will be followed by a reading of the day's manifesto. Afterwards the floor will be opened up so people can share with the crowd their reasons for attending the demonstration. The day's programme will wind down in the evening with a 9.30pm screening of Petra Bioudina Volpe's El orden divino in the cinema. Activities marking the special day will run through the month. In fact, they start Monday March 4 with the 7.30pm opening of Natalia Lisinicchia's exhibit TACTO in the administration's Sala d'Exposicions (Ajuntament Vell). At 7.00pm on Thursday March 7 islanders across the Balearics can catch a simultaneous screening of a documentary. The IBDona-produced Llavors de futur. 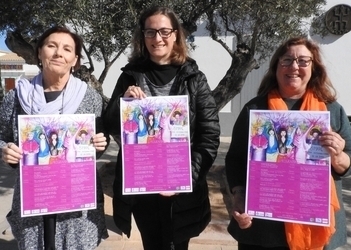 Un homenatge al feminisme de les Illes Balears will début at the cinema (Sala de Cultura). The programme continues with the “Woman's Charity Race” (Cursa Solidària per a la Dona) from 11.00am on Saturday March 9. Money raised will go to benefit the Asociación Española Contra el Cáncer. Signups are being held at the front counter of the fitness centre. More film screenings and a storytelling session at the Casal de Joves are also on the bill of activities, not to mention a presentation of the magazine “Visions” that will be followed by a discussion. Among all the events in store, one of the most closely watched will take place at 12 noon on Sunday March 31 in the Council's Sala de Plens, adjacent to the Centre de Dia. It is the XI Homenatge a la Dona Gran (“Eleventh Tribute to the Elderly Woman”) of Formentera. In April, there will also be a self-defence workshop for women. Councillor Parellada reminded islanders that www.reaccionem.com features a link where people can sign the pact to end gender violence. She also saluted Espai Dones for putting together a programme of activities that is in constant expansion and reaches an increasingly diverse audience, something she said is “key to making sure this struggle affects every one of us”.